With the advent of multiple screens in a single theatre, functionality became one of economics  more individual screens in a complex meant more people, hence more dollars. 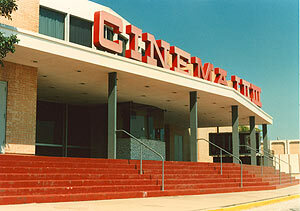 For Houston, the change began in 1965, with General Cinemas Cinema II Theatres at Gulfgate, Meyerland, and Northline. Suddenly, patrons had a choice of features in the same building, and took to the concept with enthusiasm. 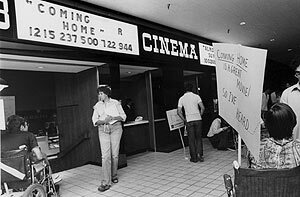 This was followed by a trio of theatres constructed for American Multi-Cinema (AMC):he Almeda 4 at Almeda Mall, Northwest 4 at Northwest Mall, and Town & Country 6 at Town & Country Village. As the sixties progressed into the seventies and then the eighties, theatres lost their glamour in favor of purpose alone, with smaller auditoriums (some seating as few as 150 people) and minimal interior decor. At the same time, the new constructions made it harder for the older neighborhood theatres to remain in business. Many resorted to becoming dollar houses in order to stay afloat. By the middle eighties, Houston had reached an oversaturation point in individual screens. Despite this, more theatres were built, along with the number of auditoriums per theatre. The opulence of the early days was out, not only because of simplicity of construction but economics as well. However, audiences were becoming increasingly agitated at the shortcomings of the multiplexes. While sound and picture quality had reached new technological heights, sacrifices were made in other areas, such as the state-of-the-art sound from one theatre distracting patrons in the adjoining auditorium. Ticket prices were higher and concessions cost more, while the individual screens continued to shrink. The change back to theatre opulence occurred first with the Cineplex Odeon Spectrum 9, at 2660 Augusta, which opened on June 24, 1988. Architecturally, the theatre tried to recapture the dazzle of older cinemas, not by opulent flourishes, but by grand scale and a multiple level lobby. Cineplex Odeon followed this with the River Oaks Plaza Theatre, a twelve-screen version of the Spectrum, located on West Gray at Waugh Drive. 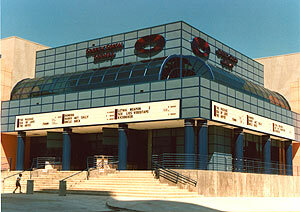 The defining moment for the multiple-screen theatre was in 1996, with the introduction of stadium seating, beginning with the Deerbrook 24 and Woodlands Tinseltown. Even the Cineplex Odeon palaces were not able to survive this new innovation. 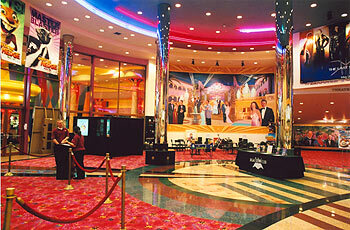 The number of screens continued to grow, reaching its height in 1997, with the opening of the AMC Studio 30. The General Cinema Meyerland Cinema, along with the Gulfgate and Northline cinemas, opened on Thursday, April 13, 1965, with the world premiere of Mister Moses, with Robert Mitchum. The Cineplex Odeon Spectrum Theatre. After many years of shrinking auditoriums, the Spectrum managed to bring back a sense of glamor to theatre decor. 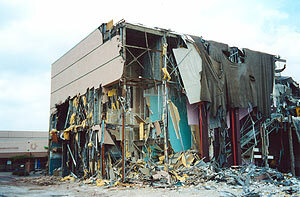 The Cineplex Odeon River Oaks Plaza Theatre undergoing demolition in April 2002. 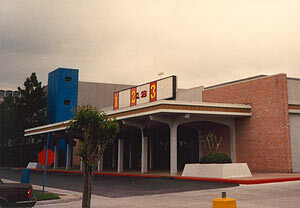 American Multi-Cinema (AMC) came to Houston on Christmas Day, 1969, with three multicinemas that opened simultaneously. The Almeda 4 at Almeda Mall, Northwest 4 at Northwest Mall, and Town & Country 6 at Town & Country Village. 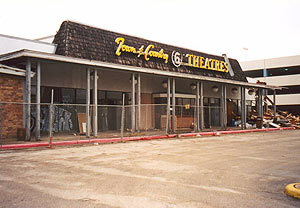 This phot was taken during its demolition in 2002. Loews Town & Country opened on June 28, 1972, and was a mere walking distance from its neighboring competitor, the AMC Town & Country. Both buildings are now gone.